When preparing the upload of the next version of JBST to wordpress.org I found the usage of comment_form(). The documentation of comment_form() can be found at Function Reference/comment form. The documentation of comment_form() doesn’t explain why you should have to use this comment_form() call instead of code your comment form’s HTML directly into your comments.php template. On the first sight using comment_form() and setting the comment form field’s HTML by PHP as an function argument or inside a filter, seems the break the MVC principle. Templates should not contain PHP code at all. The comment_form function is new to 3.0. Basically, it standardizes the comments form. It makes it wonderful for us plugin authors, since now we can easily modify the comments form with various hooks and things. Please notice that the value of fields overwrites the settings of the comment_form_default_fields filter. 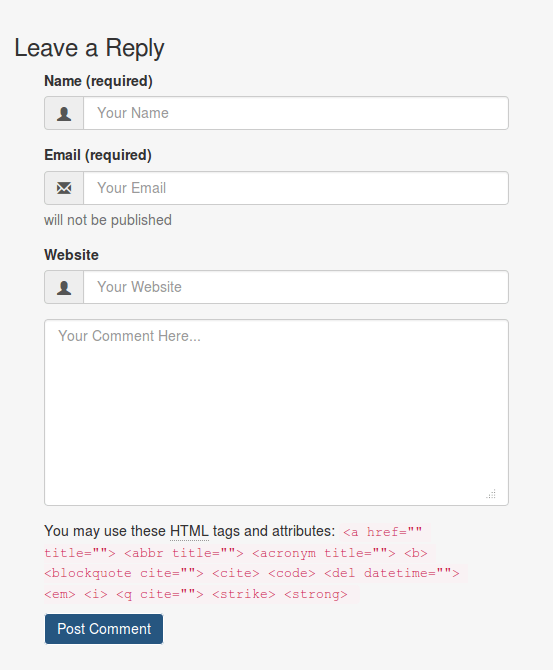 The preceding code don’t set an email or url field which means the comment form won’t have these field too. When using comment_form() in your templates you don’t have to code the different situations where the user is logged in or not, where the comments are open or closed, and so on. On the other hand you still have to code the function’s argument or filters as shown in the preceding. Popular themes such as “Twentythirteen” use the comment_form() code which enables (plugin) developers to change the look and feel of the comment form with filters or CSS. In this standard situation theme coders only have to write comment_form() in the comments.php template and style the form with CSS. Good tutorial. Used it to develop my own customized contact form plugin, where I re-define the $args for the comment form fields. But it turns out, while testing, that some themes create their own ‘textarea’ field, which adds to my ‘textarea’ field, resulting in two comment text fields. Not good. I have set my add_filter( ‘comment_form_default_fields’, my_function(), 99,1) with a higher priority (99) so that it happens later in the ‘page build’ (after the theme does it’s comment_form_default_fields), but the duplicates comment text boxes are still there. Also tried a priority of 8, and that didn’t do it either. I also tried unset($arg) (the parameter passed to my_function; contains the array of fields/etc), and a unset($_GLOBAL[$arg]), and still the duplicate textarea field shows up. So, can you think of a generic (works for any theme) that can determine if the comment field has already been defined? And, if the duplicate is found, remove the one in the theme, so I can replace it with mine? Or is there a better way to ‘start over’ on the defining of fields in the comment form. I understand that the problem might be caused by bad coding practices on the theme, but would like to find a workaround so a theme doesn’t change the fields I want on the comment form.